Ever since I first used an Apple Smart Cover on my iPad 2, it has become a near-constant companion for my iPad 2 and now iPad 3. I’ve often written here about how the Smart Cover plus an ultra-thin Gelaskin have tended to be my favorite ‘outfit’ for the iPad. So I when I bought the iPad mini on launch day a few weeks ago I purchased a Smart Cover for it right away, hoping it would become just as great a companion for the iPad mini as its bigger cousin has for my other iPads. Apple has got Smart Covers available for the iPad mini. Just like the smart covers for the iPad 2 and iPad 4, these will align perfectly with the left side of the iPad and will automatically wake and sleep the iPad mini when they’re opened and closed. Right now Apple have only got the polyurethane smart covers available for the iPad mini – not the leather models that are an option for larger iPads. The iPad mini smart covers are priced at $39, the same as those for the bigger iPads. iPad mini smart covers come in 5 colors: dark gray, pink, light gray, blue, and (PRODUCT) RED. They’re currently shipping in 1-3 days and I imagine they’ll be available in Apple stores on launch day. You can see full details and place an order for an iPad mini smart cover at the Apple product page for them. I think this will likely be my first iPad mini accessory. How about you all? 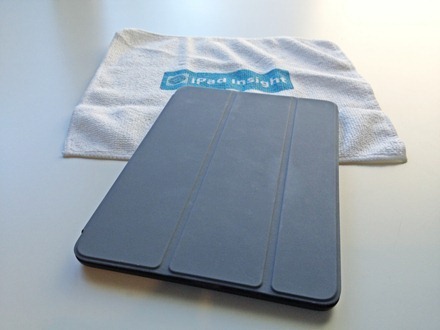 For those of you planning on getting the iPad mini, will you be looking at getting a smart cover for it?